Get your school started with skiing or snowboarding, without stepping foot on foreign soil! As well as being a great recreational activity, skiing is a serious sport, with work opportunities and gold medals for the best. It uses different techniques from ball games, but demands many of the same skills – balance, coordination, agility, strength and fitness, disciplined attitudes and mental courage. The first step is to arrange an initial taster lesson or book a beginners course at one of the ski centres or clubs across the UK most of whom accommodate children as young as 4 years old. STEP 1 - Find your local ski centre using our Find My Nearest... search. STEP 2 - Call up your local ski centre explaining you've seen their information on GO SKI GO BOARD, book and enjoy! 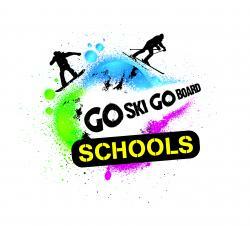 STEP 3 -Sign up to GO SKI GO BOARD for free to download the marketing resources and advertise online with a dedicated schools profile. STEP 4 - Contact us at info@snowsportengland.org.uk to see if there is any additional support, campaigns or funding that you could benefit from. How GO SKI GO BOARD works? Flexible sessions can take place at a time suitable for you, depending on availability. 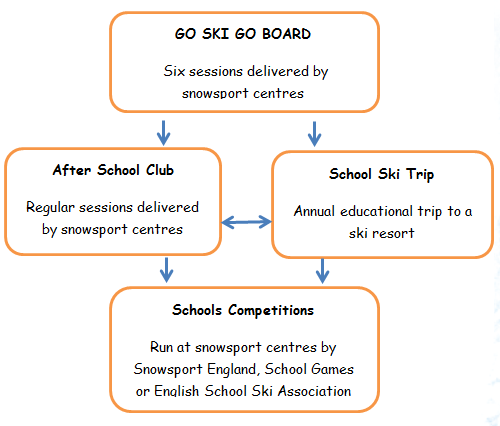 GO SKI GO BOARD Schools Pathway - What's Next? As a follow on from lessons; if your students have caught the snowsports bug; or in preparation for an upcoming school ski trip, there are a choice of next steps. You can use the 'Find My Nearest' search tool, to find your local ski centres' offers ranging from day courses, satellite clubs, improver courses, introduction GO RACE GO FREESTYLE sessions or fun competitions. Teachers - What's in it for you? Staff are welcome to be involved alongside students – a sport for everyone! Leadership of skiing and boarding groups on the piste in snowsports resorts is both a challenging skill and a highly rewarding activity. These leadership courses are increasingly becoming a pre-requisite of Local Authorities for Lead Teachers on School Ski Trips. A basic 6 hour course designed to give teachers, youth leaders and other competent persons the skills necessary to organise a snowsport course for groups including young people in recognised ski resorts in the UK and abroad. You can find upcoming SCO & ASCL courses on the Snowsport England Website. The Alpine Ski Leader (ASL) course is designed to train and qualify responsible skiers who are interested in the encouragement of young skiers and who seek to lead such skiers within the boundaries of snow skiing resorts.